Colorado Spoon with D lead or banana sinker for casting weight. The split rig becomes the clevis in the rig shown above. The two split rings spin as the lure is retrieved. 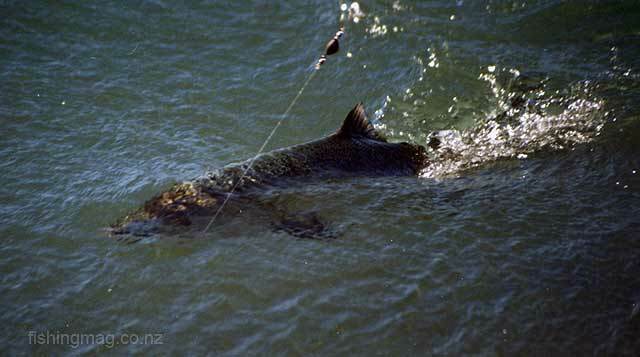 Most salmon taken nowadays are caught on Zed spinners. However, they are also caught on flies and Colorado spoons like the one shown here. This was a very popular rig 30 plus years ago but is seldom seen today. It is successful when used to fish the fast water of the river “gut” and in deep holes up-river. I remember this rig being used to great effect by anglers fishing the very fast water of the Waitaki River gut during a salmon fishing competition many years ago. At the time there were some 500 cumecs (cubic metres of water per second) flowing through the narrow gut. The raging torrent of water was very fast and deep. Big Chinook salmon were running in from the sea up through gut into the river. As they did so they were hugging the bottom where “shear effect” means the flow is slightly less right down on the bottom. Anglers were using Colorado spoons, heavy line, and 85 g (3-ounce) sinkers, and more, to get their small bladed Colorados down to the bottom. Every so often an angler would go running past towards the surf with a fish on. The salmon would, of course, be unstoppable in such fast water. The only option being to let the fish take off line and hopefully eventually land it in quieter water further down the beach. It worked for some but many fish got off. No doubt some would have been foul-hooked too I guess. 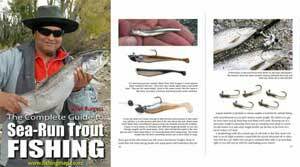 You can read about fishing Colorado spinners back in the day in Memories of Salmon Fishing Days Past – 70 Years of Salmon Fishing by Clive Morriss. Many will be surprised to learn that Zed spinners, so popular today, are a relatively recent introduction. These are often used when fishing deeper water in a hole upstream. Some anglers take salmon on them at McIntoshes Rocks in the lower Waimakariri River. Their advantage is that they can get right down to the bottom where the salmon are lying. The blade spins when the lure is retrieved so there is plenty of lure action even in still water. The larger the spoon the greater the water resistance. In faster water, the spinner will also tend to rise to the surface. When retrieving upstream against a strong current it can be difficult to retrieve the Colorado spoon. At such times it is advisable to use a smaller blade on the spinner to decrease resistance. The arrangement shown is also difficult to cast any great distance without eventually becoming tangled. It also tends to snag on sticks and other obstacles on the bottom more readily but only because you are more likely to get your lure all the way down – which generally is a good thing when salmon fishing in deep water and strong current. Sink rate and lure fishing depth can be controlled quite well by changing to a lighter or heavier lead depending on water depth and flow rate. Check your Fish & Game fishing regulations booklet for the distance the lead must be from the lure. Salmon caught on a Colorado blade spinner using a D-lead for casting weight, and to take the lure down near the bottom. A big advantage of the Colorado spinner over other lures is that you get a great deal of flash from the lure even at very low speeds as the blade spins on the clevis.